Heaven Changes Everything is a devotional reader based on the bestselling Heaven is for Real (a young boy’s experience of going to heaven and back). Each of the 42 short chapters begins with a quote from Heaven is for Real, followed by a personal reflection based on that quotation, and ending with a sentence of advise and a Bible verse. Some of the topics focus on heaven, but many are narratives of general Christian living. Overall, the book reads like a blog of reflections on past experiences: candid and personal encouragement about life and God through day-to-day stories. I felt that this book was “just okay.” I enjoyed reading many of the stories, but didn’t feel it was deep enough or substantial enough to compete with the many other devotional books on the market. I also thought it was odd–considering this is a devotional reader–that each chapter was focused on a quotation from Heaven is for Real, instead of on a scripture or Bible passage. I would have liked to have seen the scripture have a larger part of the message–not that the messages were unbiblical (they weren’t)–but that a focus on scripture can bring an additional layer of wisdom to our personal experiences. The format was such that the scriptures felt like an after-thought, rather than a reflection point. 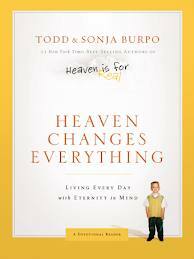 So, despite some of the encouraging context, I don’t feel that Heaven Changes Everything is a resource I can recommend.